Synchronous Servo Drives with powerful motor systems and integrated electronics for operation at selective 24VDC or 48VDC. These very compact drives are well suited for peripheral application in single or multi axes systems. 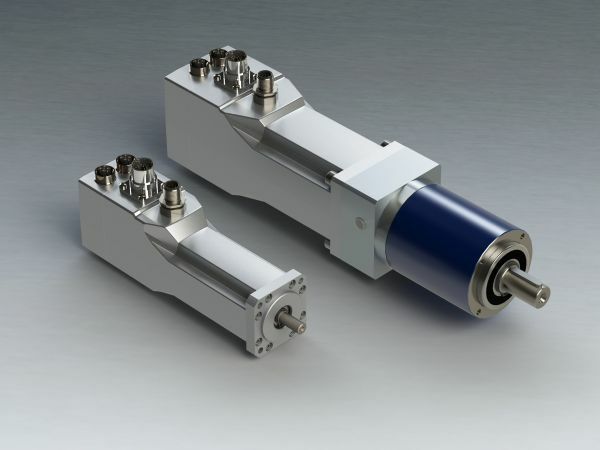 Due to the high resolution evaluation of rotor angle these drives become real dynamic servo systems. Combined with the motors sinusoidal current feed a constant and even torque development is assured and excellent control properties are achieved. The basic devices are operated either by analogue/digital signals or via the CANopen® interface. By means of an optional fieldbus module, the devices of the HFI series can be integrated into common, Ethernet-based fieldbuses, such as EtherCAT, PROFINET or EtherNet/IP. The drives support operating modes profile position, profile velocity and profile torque mode. The profile position mode supports absolute and relative demands. In single-turn version, homing is done onto limit switches, against a mechanical stop or at the current position. The drives are optionally available with functional safety „STO“ according to Performance-Level [e], cat. 3; SIL 3. The electrical connection is done through a compact rotary connector equipped with one, two or three plugs depending on the drives version; with optional fieldbus module via radially arranged flange plugs. The drives configuration is done via RS232 and a clear and simple to use PC-Software "DSerV".